Andy Smith 9 months, 1 week ago. Our party of ten and Poppy assembled in Ashford-in-the Water. We were pleased to welcome Robin, Andy and Rosy’s friend into the group and as the church bell chimed 11 o’clock we began the steady climb up to Dirtlow Farm. We found the partially hidden stile at the corner of a barn and then joined the Sheldon road. before heading along the track to Magpie Mine. The sun briefly appeared from an overcast sky, and the party vied for best ‘seat’ to enjoy coffee in a welcome breeze. A short section of road walking brought us to the head of Deep Dale and we stopped for lunch before descending the dale on an unusually dry footpath. A short climb brought us into Shacklow Wood and we followed the delightful path through the trees before emerging at the side of the River Wye. Here moorhens, coots and a pair of swans with five cygnets were taking advantage of the cool water. 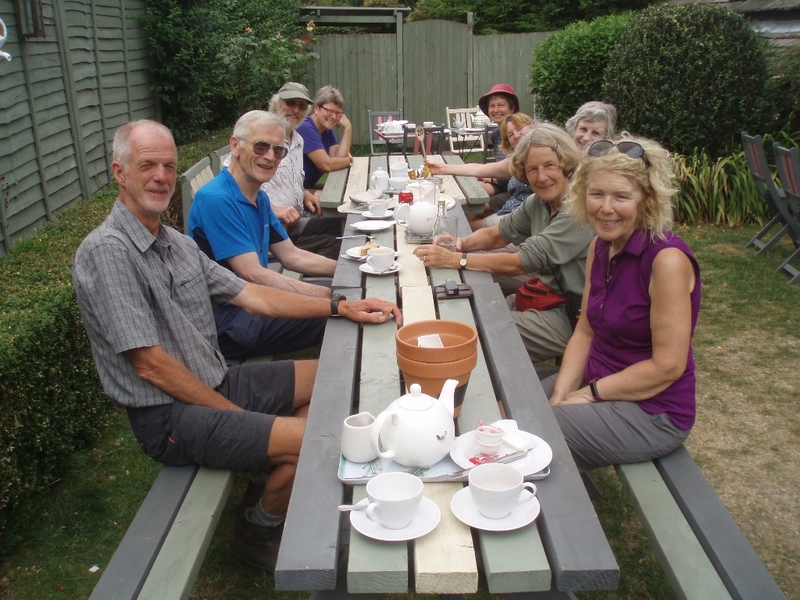 Before long we were back at our starting point, and we all took advantage of the tea and cakes in the village tea-room. A very enjoyable 7.1 miles. Thanks to all who came along.